Winterize my current cyclocross bike. This option has the obvious advantage in that it's cheap, since I already own the bike. I was thinking about swapping out my Schwalbe Racing Ralphs (700×33c) and going with the widest possible tires I can fit, probably 700x40 with studs. Buy a fat bike. I've seen a lot of people talking about how much fun a fat bike is in the winter and how good they are for commuting. My main concern is the weight and climbing ability of these monsters on steep winter ascents/descents. Does this seem like a good option for my commute? I like this option because I could keep cycling through the winter, but this also involves buying a whole new bike. Any opinions/experience is much appreciated. Thanks! My commute is 7 miles with ~2300 feet of elevation change. There are two short, but steep climbs with rolling hills interspersed throughout the rest of the ride. I'm mostly worried about the steep morning descents in bad weather and trying decide which bike option would give me the stability I need. Hauling a heavy fat bike up the hills is less of a concern, but climbing weight is still important to me. Here are the things I believe you should be considering when making the decision. Fat bikes climb just fine. Yes, a road bike will climb a paved hill more efficiently than a mountain bike under the same conditions. But, a mountain bike will also climb a muddy single track that a road bike would simply fail to move at all on. Efficiency and utility are trade offs in this respect. A cyclocross bike will be more efficient in many conditions. However, at some point your cross bike will become unrideable (too much/deep/wet snow) and a fat bike will plod on. Depending on your weather and commitment to riding, a couple days a year where you shelve your cross bike and take other transportation may be acceptable for you. However, if you want to make sure you can ride as often as possible, a fat bike will offer you more commuting days. A fat bike also offers an advantage in this area as far as not finding out halfway into your commute that you are going to be pushing your cross bike the last 3 miles. It's slower, but a bit more honey badger. As far as safety, I'd much prefer to descend with ANY snow on a fat bike than a cross bike. Thinner tires may cut through snow for traction, but when descending that sinking has a tendency to yank the front wheel all over the place. A wider front tire will float and may have a tendency to wash, but not dig and turn. A fat bike would open up new options to you for winter trail riding. A cross bike just doesn't even enter into this equation. However, if you aren't into trail riding, it isn't really an advantage to you. Personally I enjoy winter trail riding above all other forms of riding and I live in the right place for it, so fat bikes are THE bike for me. How much snow are we talking about? I’ve commuted through the winter on a cyclocross and had very little problems. The roads here (Austria) are usually cleared quite well, so I’ve never had deep snow. For black ice I used studded tires (Nokian Hakka W106) which — due to their narrowness (35mm) — also work quite well on slush. I’ve had the most difficulties with packed ruts which either prevent you from turning or break away on the borders (if the snow and ruts are still relatively new and not frozen over). For offroad usage with deep snow a fat bike is probably better. 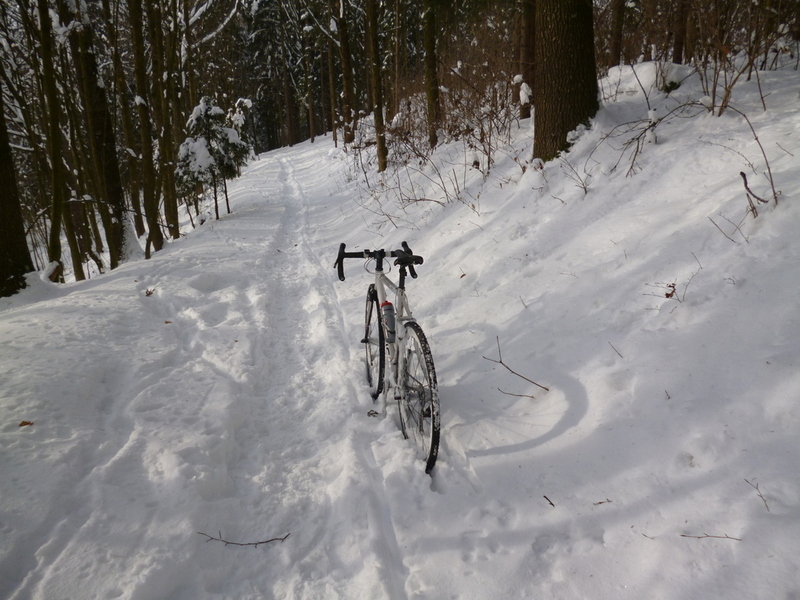 Riding a cyclocross on paths in conditions like this one (notice that the bike is standing without any support because the snow is so viscous) is very hard and exhausting. Make sure you have enough gears, riding with studded tires and/or through snow is hard. Not the answer you're looking for? Browse other questions tagged winter cyclocross fatbike or ask your own question.